Gosh! Barnaby Volume Three (1946-1947) is here! 74 years ago this month, five-year-old Barnaby Baxter wished for a fairy godmother. Instead, Mr. O’Malley — a loquacious, endearing, pink-winged con-artist — flew through Barnaby’s (open) bedroom window, and announced himself as the lad’s fairy godfather. For the next ten years, devoted readers of Crockett Johnson‘s Barnaby saw O’Malley elected to congress, running a business, and — in this volume — becoming a diplomat trying to avert war between the U.S. and Sylvania. Barnaby Volume Three brings our cast of characters from the relative clarity of the Second World War homefront into the anxieties of the Cold War era. For those who may be new to the series, other characters include Atlas (the mental giant, shown above holding a slide rule), Gus the Ghost (too timid to be effective at haunting), Gorgon (Barnaby’s talking dog), McSnoyd (the invisible leprechaun who, in this volume, does briefly become visible), Jane (a no-nonsense little girl and Barnaby’s next-door neighbor), and Barnaby’s parents. The strip is both fantasy and topical satire. The children can see the fairy characters but the adults (usually) do not see them; we readers know, however, that the fantasy characters are real and not just a projection of Barnaby’s and Jane’s imaginations. Because O’Malley is a character of possibility, Johnson can put him into any situation he’d like to satirize, be it politics, filmmaking, diplomacy, or high finance. Barnaby never had a mass following, but — like Krazy Kat — did have many readers who either were or became influential. The strip’s fans include Chris Ware, Art Spiegleman, Daniel Clowes, Charles Schulz, Dorothy Parker, and Duke Ellington. 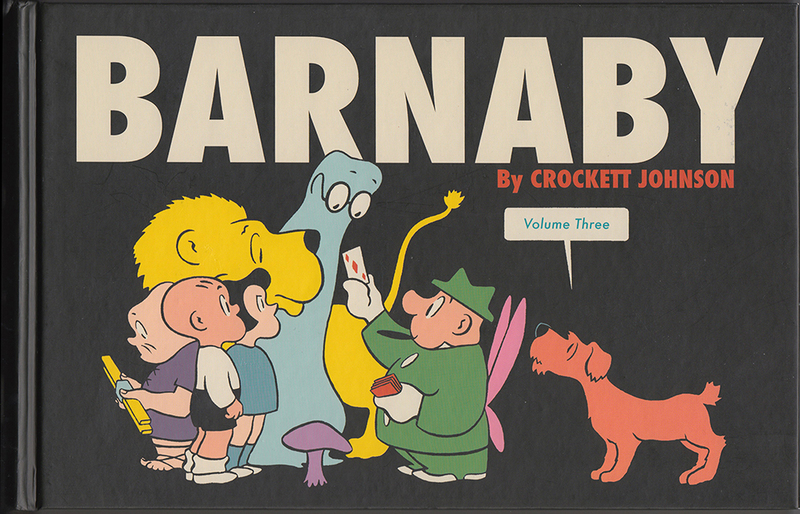 As Ware says in his foreword to the first volume, Barnaby is “the last great comic strip” that has yet to be collected — which, of course, our five-volume series in the process of realizing. Barnaby Volume Three‘s official release date is June 1st, but — I am told — copies of the book may well start shipping in May. 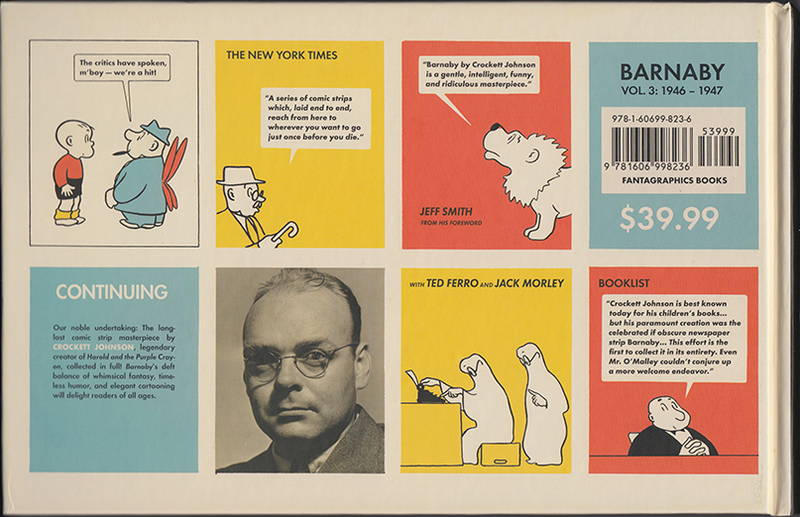 After you enjoy Daniel Clowes‘ book design and open the cover, you’ll find…. 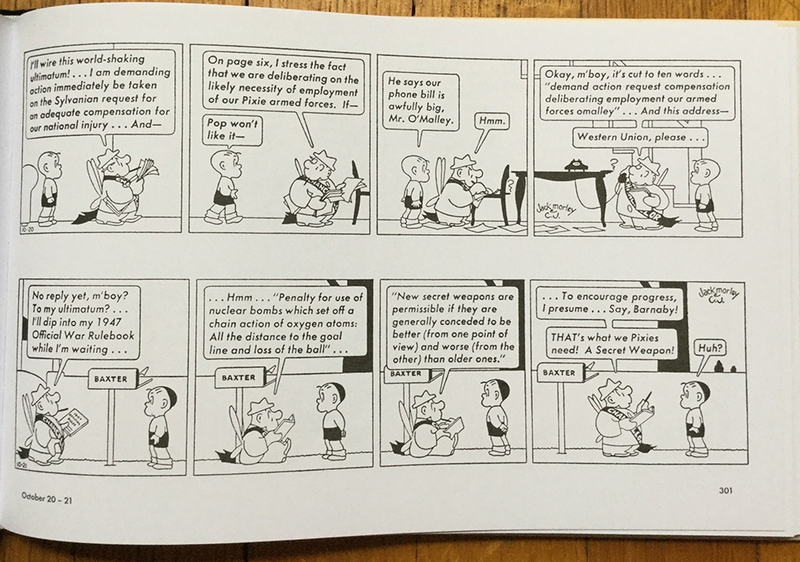 and, for those who may be curious about the strip’s many allusions, notes (also written by me). I hope you enjoy the book! You can buy it via Fantagraphics, the usual online retailers, and your local brick-and-mortar bookstores and comic shops (should you be fortunate enough to have either of these in your area). Our — that is, my and my co-editor Eric Reynolds’ — plan is to bring out Barnaby Volume Four: 1948-1949 in 2017, and Barnaby Volume Five: 1950-1952 in 2018.